I have always been a fan of Jaybird Quilts patterns. I will admit I collect them, and have collected more than I make. I just love how her geometric designs fit together! So when she created the Gravity Quilt block of the month, I knew it would be one I would have to make! My mom bought me the kit for Christmas one year. And then the kit sat for about two years, in a nice bin, on a shelf. But then I joined the American Patchwork and Quilting UFO Challenge! I knew this would be my determination to finally start this quilt! It’s number was picked in February of 2017 and I had the top finished in June 2017. Pretty happy with that. And what’s funny, once I started I realized how easy this quilt was! I was accustomed to Julie Herman’s instructions and shapes and rulers, it came together in one month instead of nine! I remember I chose it specifically during an extremely stressful time at work and needed a way to relax when I came home. 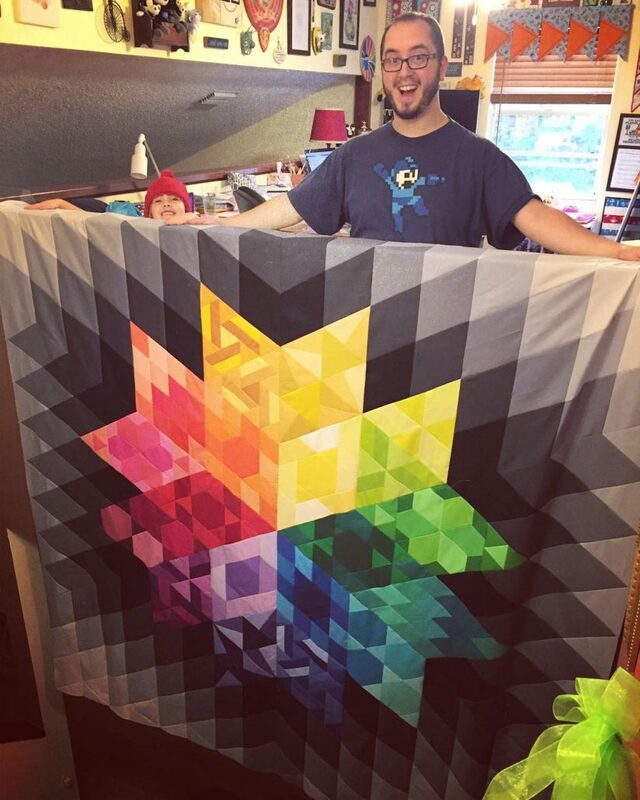 Ever make a quilt so large you need your husband and daughter to hold it over the loft balcony to get a picture of it? Yeah, that was a first. Until my King of Scrap of course, more on that quilt another time. Sadly Gravity waited another 8 months before I had a chance to quilt it, folded away on another shelf. 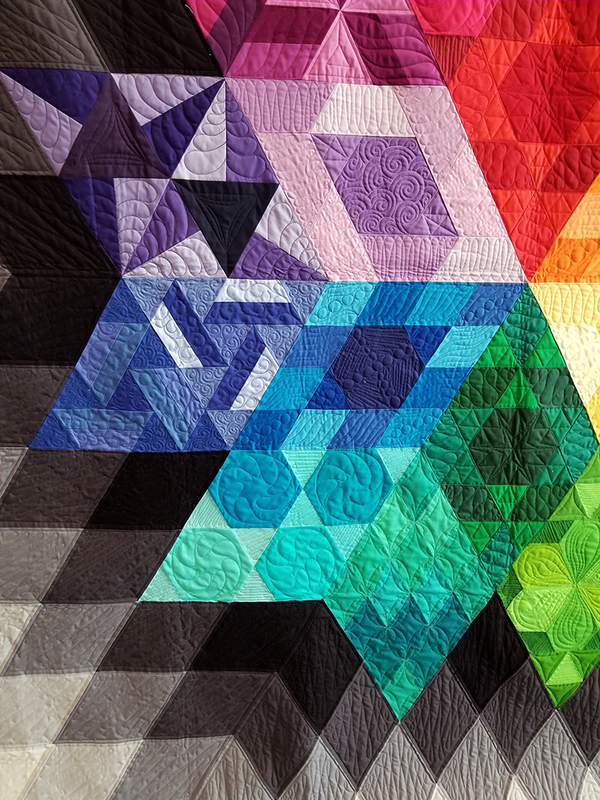 It’s definitely on the top of the list for a longarmer’s dream quilt. This February I decided it could work in my guild’s quilt show, so on to the frame it had to go! So many quilting options available! I did the entire quilt in free motion and ruler work. That’s right, ME! No computer involved! Color Center Stitches: 105,477 at 11 stitches per inch. Hanging: Sew Totally Solid, Tampa Modern Quilters Guild challenge exhibit at the Original Sewing & Quilt Expo in Lakeland, FL. March 2018. 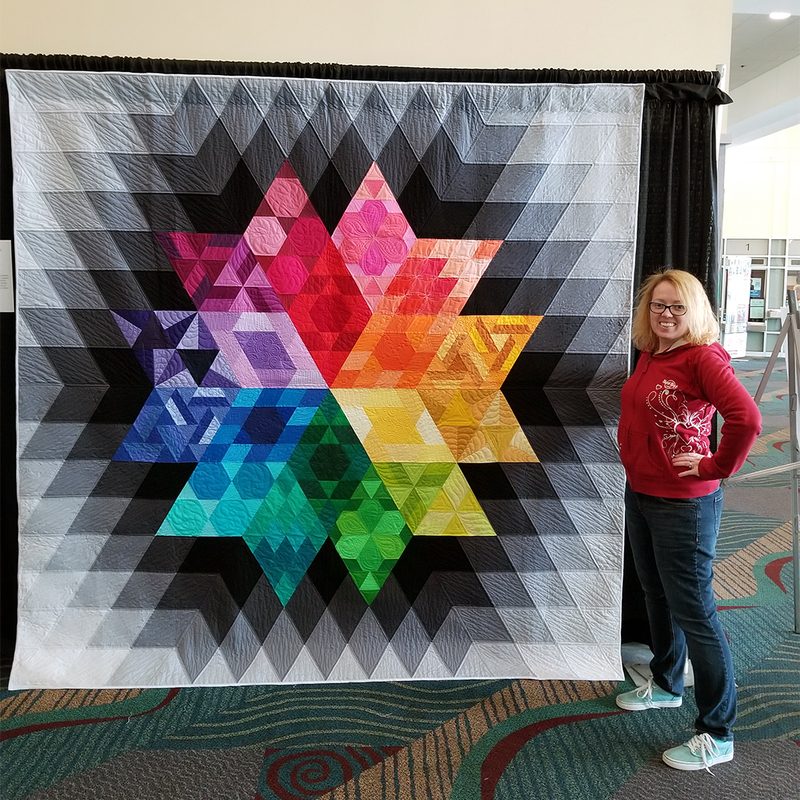 AQS Quilt Week Virginia Beach, Virginia, October 2018.